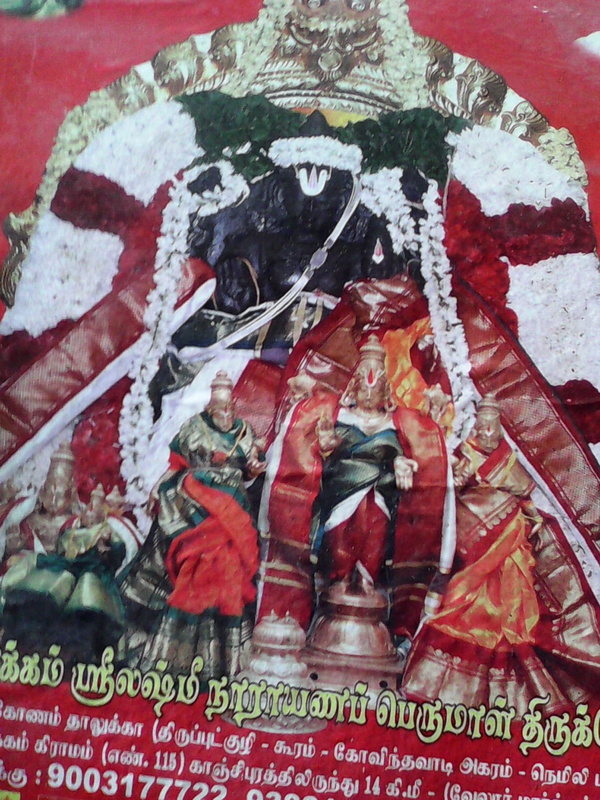 Sri Lakshmi Narayana Perumal temple – Melvenpakkam. It is with immense pleasure that I begin to share my experience during our visit to the “Sri Lakshmi Narayana Perumal” temple along with my family.The temple is situated approximately 100-110 kms from Chennai. The temple is located in a small village at Melvenpakkam in Vellore district. As you enter the village, there is an whiff of freshness in the air. Obviously this place is tucked away from the hustle and bustle of the city life. Interestingly the roads are pretty good and you can reach the temple without any unwanted to diversions or bumps.Trust me, this is a very small temple. It’s bereft of any big Vimanaas (towering gopurams) etc. It is like the next door “Ganesha temple” that we get to see as we traverse in the city or in our very own place. The Lord “Sri Lakshmi Narayana” along with his consortium “Sri Lakshmi” graces the temple. All of us in our family were awe-struck when we saw the deity (both the moolavar and utsavar). The reason is pretty simple – inexplicable beauty and the power of the God. The temple is 1700 years old and the Lord is conisdered to be a “Swayambu Moorthy” here. Legend has it that this place is very significant because Lord Anjaneya is said to have worshipped the presidind deity “Sri Lakshmi Narayana Perumal” here (to get rid of the possible sins since he had to demolish the demons at Sri Lanka to help Lord Rama in his mission to bring back Sita Devi from Lanka in Ramayana). Hence this place is also famous to be known as – “Deivame Deivatthai poojitha sthalam”. You can visit the temple on any day and the Lord will bestow his blessings on each and every person who makes it a point to visit this place. Fridays are considered auspicious since “special paayasam” is given to couples waiting to be blessed with a child. The perumal is also know as “Pillaikaaran Perumal” since legend has it that the Lord is definitely known to bless the childless couples with children soon. All other days are also equally auspicious to visit this holy shrine. So where is this temple located? From Chennai, you need to take the Chennai-Bangalore Highway and keep travelling approximately for about 95 kms. As keep you travelling you will see a slight diversion on the left go get in to “Dhamal”. Skip this and just go straight for about 4 kms approximately and you will notice a small sign board on the NH with a direction to take a right turn to get into this village. From here it is very easy and takes about 10 minutes to reach the temple. Not sure about the timings in the evening. So what are you all waiting for? Just pack your bags and hog into your vehicles to visit this temple and seek the blessing of “Sri Lakshmi Narayana Perumal”.